Bread pudding. How do you feel about it? On a dessert menu, it’s about the last thing I would order. Actually, the last thing I would order would be panna cotta but that is because it’s not vegetarian (that damn gelatin!). I love bread but not in my dessert. Chocolate anything would be first on my list followed by berry something, lemon something, apple something and then pear something. Bread pudding would be my desperation dessert. So yes, I looked at the list of ingredients and thought – 8 eggs and 4 cups of half and half? I will make this but I won’t eat it. But oh yes, I did eat it. Lots of it. It did not taste heavy at all, more eggy than creamy and I mean that in a good way. 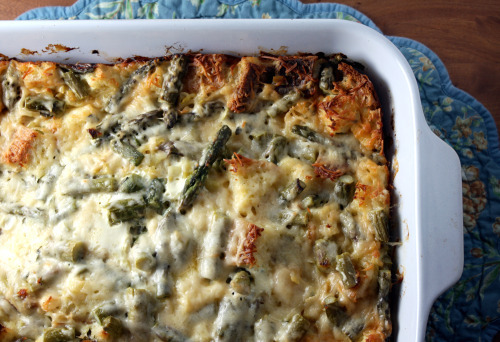 The balance was just right between the starchy bread, the creamy filling, the grassy asparagus, the sweet leek, the fragrant lemon thyme, and the bit of super salty cheese on top. I could eat this every day and be happy. One note – if you can get lemon thyme, buy it. I use a lot of thyme in my cooking life and I am lucky enough to have 5 plants of it in my front yard. Right by the stairs is a lovely bush of lemon thyme which I pick from all spring and summer. You might not think it would taste that different, but it is a completely different herb. Like taking something good and making it great. 1. Spread the bread cubes on a baking sheet and let stand overnight to become stale, or quick-dry in a 200ºF oven for 40 minutes. 2. Preheat the oven to 350ºF and butter a 13-by-9-by-2 inch baking dish. Bring a large pot of water to boil, add the asparagus, and cook until it is bright green, about 2 minutes. Drain and blanch immediately in the ice water; remove and set aside. 3. Remove the dark green part of the leek and discard. Halve the leek lengthwise, rinse well between layers, and thinly slice. In a sauté pan, heat the oil over medium heat. Add the leeks and sauté until they begin to brown, about 10 minutes. Add a few tablespoons of water and continue to cook for 5 minutes, or until the leeks are caramel colored and tender; set aside. 4. In a medium bowl, whisk the half-and-half, eggs, lemon zest, and thyme. Put the bread cubes in the prepared baking dish and sprinkle on the leeks. Arrange the asparagus on top and pour the egg mixture over all. Press with a spatula to submerge the bread cubes; sprinkle the top with the cheeses. 5. Cover the dish loosely with foil and bake until the edges are golden brown and a butter knife inserted into the center comes out clean, about 1 hour and 15 minutes. Cool for 20 minutes, cut into squares, and serve. Nice pudding recipe. Looks so yummy and delicious. Lovely pics. I have to admit. Bread pudding is my number one dessert. Ever. But that may be due to the fact that I am a serious carb fiend. Always have been, always will be. Then again that also means that I would adore this savory bread pudding. Love asparagus and leeks. And yes I am jealous about your myriad of travel destinations but I hope you’re having fun! I hope you are having fun! I had the most amazing bread pudding in NOLA which I have been dying to recreate, but still haven’t touched a savory version. Looks like a great vegi main dish to serve a crowd. Perfect! i’m also not that into dessert bread puddings, but this I can get behind! I can’t wait to try it! 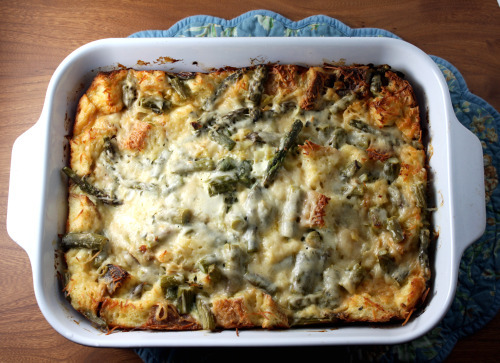 Love the idea of a savory bread pudding, this looks delicious! Yours looks WAY better than mine… Mine needed more veg. And gooeyness. And love. Thanks for the recipe. This looks great! We are trying to eat more vegetarian dishes so we’ll be back for sure. That sounds wonderful, like it could be counted as among the most gourmet of comfort foods. I can just imagine it with a nice glass of white wine. I like bread pudding for dessert at home. I would not order it in a restaurant since reading that a lot of times the untouched bread from bread baskets gets recycled as bread pudding. YUCK! Love this recipe. Looks scrumptious! I definitely don’t hate you for being in Cannes. Soak some loveliness up for me. 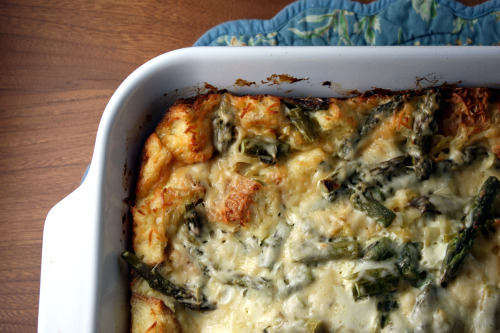 Love stratas and savory bread puddings–I find them to be the perfect vehicle for leftovers. And I’m enjoying my little lemon thyme bush, too. I’ve made a savoury bread pudding sort of similar to this before but yours looks much more stunning! Forget dinner – this is totally breakfast in our house!